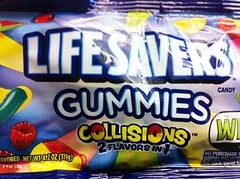 Who doesn’t love Livesavers? Or gummies for that matter? What if they came together into one product? The “mash-up” flavors are : Pineapple Punch, Raspberry Lemonade, and Cherry Watermelon. While all flavorful and yummy they all tend to scramble so it becomes a “suicide flavor mix” in ya mouth. Which is good and bad depending if you want distinctions in your bites. I say just shut up and enjoy the medleys.